Competition models get 503 bhp and a top speed near 180 mph. It’s been a long time coming, but BMW’s high-performance X3 and X4 models are here. Say hello to the X3 M and X4 M; each wielding some serious horsepower under the bonnet along with a bevy of suspension upgrades designed to put the sport in sport-utility vehicle. Or rather, sports activity vehicle as BMW prefers. Either way you cut it, these people movers can move people fast. Seriously fast. The first step in creating a proper M machine is to add power, and BMW doesn’t disappoint. Under the bonnet of these twins is a 3.0-litre twin-turbo six, tuned to make 473 bhp and 442 pound-feet of twist. 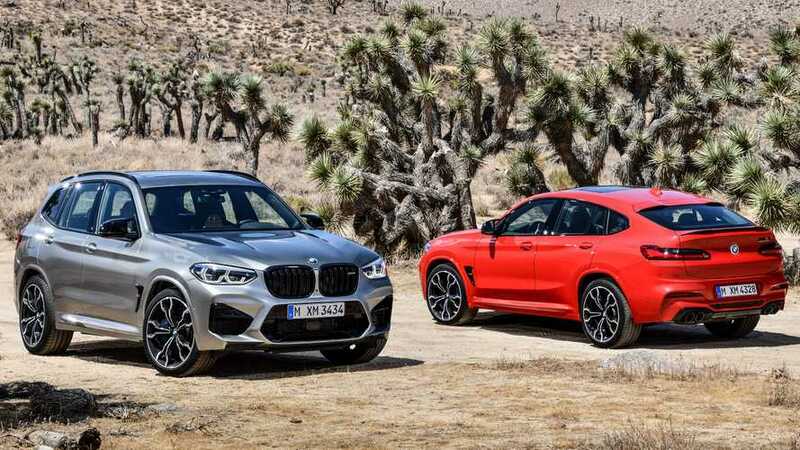 If that’s not enough for your compact performance SUV needs, BMW will also offer a Competition version in both flavours that ups the ante to 503 bhp. According to the automaker, that’s enough for a 0-60 mph sprint in approximately four seconds flat. Top speed is limited to 155 mph, unless you select the optional M Driver’s Package which ditches the limiter. In that case, you’ll hit 174 mph flat out, or 177 in the higher-bhp Competition model. Regardless of the trim, the engine feeds power through an eight-speed M Steptronic transmission that offers a manual mode should you want to change your own gears. M xDrive all-wheel drive is of course standard, and it’s enhanced with several drive modes that include a driver-adjustable power distribution setting that sends power entirely to the front or rear. Other modes like M Dynamic can vary settings for everyday driving, or for nailing a perfect lap time. As for getting sideways, BMW doesn’t come out and say there’s a drift mode specifically, but such antics are suggested in the automaker’s press release, which you can view at the end of the article. To better cope with the power, the X3/X4 chassis gets extra bracing to increase torsional stiffness. Suspension components get beefier bushings, bearings, and anti-roll bars, which are even stronger on Competition models. Electronically controlled dampers have three modes: Comfort, Sport and Sport +. There are upgraded M brakes that measure 400 mm in front and 370 mm in the back, and it all rides on new 20-inch wheels. Competition models roll on larger 21-inch rims. Muscular body tweaks help set the M editions apart visually from the pack. You’ll see a bit more black trim outside – specifically with the kidney grille – and there are of course M-specific front and rear fascias. The M twins also get a roof spoiler at the rear hatch, and among the seven exterior colour options are a new shade called Toronto Red metallic, and an M-exclusive finish called Donington Grey metallic. Inside you’ll find the requisite M interior upgrades with sports seats and plenty of leather in either black or Oyster with M logos on the backrests. Black and aluminium trim accompany the look, and drivers will see an M-specific instrument cluster behind the M-specific leather steering wheel. Competition models get a bit more panache with M Sport seats and different colour trim options. And because the X3 and X4 are still “activity” vehicles, the rear seats retain a split-folding functionality for hauling cargo. BMW says production will begin at its Spartanburg, South Carolina manufacturing plant this April with first UK customer deliveries from September 2019. So far BMW has only mentioned pricing for the higher-performance X3 M and X4 M Competition models which start from £77,070 and £79,990, respectively. Newly developed 510hp six-cylinder engine: 3D printing used in its construction. From zero to 62mph in 4.1 seconds; peak torque of 600Nm. Generous standard equipment, simplified offer structure and trademark M exterior design. Available to order now, first customer deliveries from September 2019. OTR prices starting from £77,070. For the first time, BMW M is expanding its high-performance line-up to include the X3 M and X4 M Competition models, and both will herald the arrival of a newly developed six-cylinder engine where 3D printing has been utilised in its production. 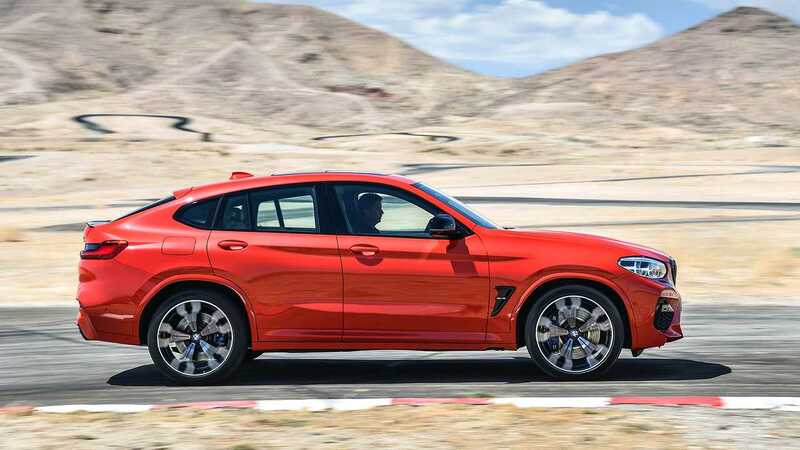 The X3 M Competition, a midsize SUV, and the X4 M Competition, a Sports Activity Coupe, will be powered by the high-revving unit that features track-proven cooling and oil supply systems as well as the latest M TwinPower Turbo technology update. Generating 510hp, the 3.0-litre in-line petrol engine has a peak torque of 600Nm while,a dual-branch exhaust system helps to deliver an intoxicating soundtrack. The ongoing development of M TwinPower Turbo technology, coupled with the inclusion of two particulate filters and four catalytic converters, ensures the high-performance, lightweight unit can claim remarkable efficiency and exceptionally low emissions for an engine of this size. In the BMW X3 M Competition combined fuel consumption is 26.9mpg* with CO2 emissions of 239g/km while the X4 M Competition returns 26.7mpg* and CO2 emissions also at 239g/km. The use of cutting-edge technology is at the very heart of the engine. Indeed, the cylinder head has a core manufactured using 3D printing. This additional manufacturing process enables geometric forms to be created that are beyond the capability of conventional metal casting techniques. 3D printing technology has cut the weight of the new engine’s cylinder head core and allowed its coolant ducts to be routed in a way that optimises temperature management. The six-cylinder in-line engine serves up its peak torque between 2,600 and 5,950 rpm. It generates maximum output at 6,250 rpm and sustains its power delivery until the 7,300 rpm ‘red line’. The BMW X3 M and BMW X4 M Competition accelerate from zero to 62mph in 4.1 seconds, while top speed is electronically governed at 155mph. If the optional M Driver’s Package is specified (available from August 2019), this rises to 174mph and the customer receives the chance to participate in an M Intensive Training in the UK or throughout the world to hone their driving skills. *NEDC Corr, WLTP figures to be confirmed. The new high-performance engine links up with the latest upgrade of the eight-speed M Steptronic transmission with Drivelogic. As well as fully automated gear changes, it also enables manual shifts with sequential gear selection. Fitted as standard along with the newly designed selector lever are gearshift paddles on the steering wheel. Manual mode allows the driver to shift down several times to the lowest gear possible in order to utilise the engine braking effect. The driver can use the selector lever’s Drivelogic switch to adjust the transmission’s shift characteristics in both automatic and manual modes. Drivelogic mode 1 aids efficient driving with smooth gear changes, while switching to mode 2 is for sportier driving with shorter shift times. The third mode makes gear changes even sharper. Both cars feature the new M xDrive all-wheel-drive system, which sends power to all four wheels for maximum traction but, unlike many other similar systems, it possesses the dynamic qualities of classical rear-wheel drive. The electronically controlled M xDrive, which works in tandem with the DSC (Dynamic Stability Control) system, only shifts drive to the front axle when the rear wheels start to lose optimum traction. As well as modifying the responses of the DSC system, drivers can also adjust the distribution of power between the front and rear wheels at the touch of a button. M Dynamic Mode – which can be activated as an alternative to the standard DSC setting – gives the driver access to the M xDrive 4WD Sport option. This shifts even more power to the rear wheels, enabling controlled drifts and particularly playful handling. DSC Off mode (with DSC deactivated), meanwhile, has been optimised for ultra-dynamic driving situations, such as on track, and can be combined with the standard all-wheel-drive setting 4WD or with 4WD Sport mode. Both cars are underpinned by a model-specific chassis technology tuned to match the engine’s high power and the capabilities of the M xDrive all-wheel-drive system. Far-reaching measures to strengthen the body and chassis mountings have a particularly beneficial effect on steering precision and both cars feature model-specific anti-roll bars, whose increased rigidity translates into more direct response, resulting in a reduction in body roll and more precise handling. The BMW X3 M Competition, BMW X4 M Competition feature M-specific adaptive suspension with electronically controlled dampers that ensure both excellent everyday comfort and direct contact with the road as well as little wheel and body movement. The basic damper set-up can be varied at the touch of a button with a choice of three modes, each with their own settings. COMFORT mode smooths out bumps in the road without compromising handling stability, while damping becomes significantly firmer in SPORT mode. Activating SPORT+ mode delivers an even tauter set-up. Steering response can also be varied by pushing a button to select one of three settings. The steering is at its lightest, yet positive in COMFORT mode, but is even more communicative in SPORT mode, where more force is required to turn the wheel. Configured for an extremely sporty steering feel, SPORT+ mode further increases the steering effort needed and maximises feedback from the road. The BMW X3 M Competition and BMW X4 M Competition also feature effective M compound brakes as standard. Featuring four-piston fixed callipers at the front wheels and single-piston floating callipers at the rear, they provide superb stopping power. The callipers are painted Blue and bear the M logo and the drilled, inner-vented brake discs measure 395 millimetres in diameter at the front and 370 millimetres at the rear. The Competition models also feature model-specific M light-alloy wheels in V-spoke design and mixed size high-performance tyres (non-runflat) to match. Standard specification for the BMW X3 M Competition and BMW X4 M Competition includes 21-inch wheels finished in Bicolour black with 255/40 ZR21 tyres at the front and 265/40 ZR21 tyres at the rear. The exterior on both models makes no secret of their performance-focused character. The large intakes at the front end ensure an effective supply of cooling air for the engine, transmission and brakes while the signature M design elements at the front, sides and rear serve to optimise aerodynamics and have been carefully matched to the power unit’s performance characteristics and the chassis’ tuning. 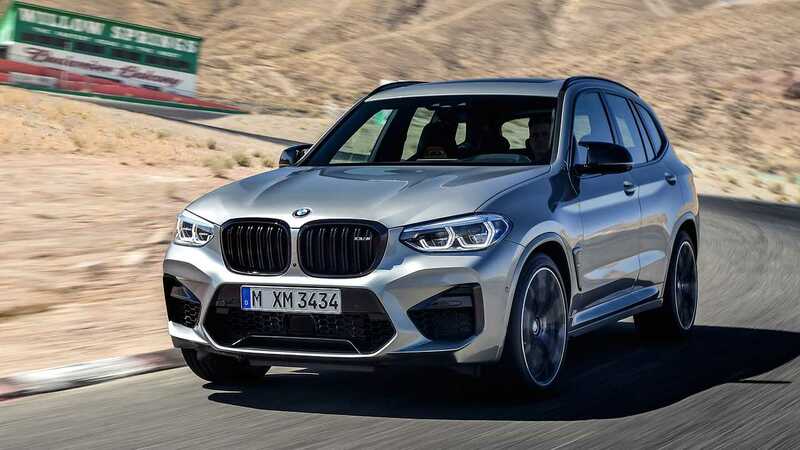 Both the BMW X3 M Competition and BMW X4 M Competition have a long wheelbase, short overhangs, slightly hexagonal wheel arches, crisp lines and clean-cut surface contouring, plus tell-tale M features to highlight sporting credentials. Alongside the large air intakes and aerodynamically optimised front apron, both models also sport a BMW high-gloss black kidney grille with black double bars. The exterior colour scheme sets the M models apart even more clearly from the standard versions of the BMW X3 M Competition and BMW X4 M Competition. The front and rear aprons, the wheel arch surrounds and the edges of the side skirts are painted entirely in body colour, replacing the usual black bordering. There is a choice of seven colours for the exterior paintwork of the BMW X3 M Competition and BMW X4 M Competition including the brand new Toronto Red metallic and the popular Donington Grey metallic, both exclusive to M cars only. An ergonomically efficient cockpit design, sports seats and a wealth of model-specific design details give the cabins of the BMW X3 M Competition and BMW X4 M Competition models a sporty yet luxurious feel while the M-style design of the displays and controls makes it easier for drivers to stay focused on the job in hand. Standard specification for the BMW X3 M Competition and BMW X4 M Competition includes heated M seats in Full Merino leather, with upper sections embossed with the M logo and electric adjustment for both front seats and Lumbar support for the driver’s seat and front passenger seat as standard. Customers can select from Black Merino leather, Adelaide Grey with Sakhir Orange highlights, Sakhir Orange, BMW Individual Ivory White or Tartufo at no additional cost. The exclusive Midrand Beige with Alcantara seat can be optionally selected, as can Carbon Fibre interior trims. Although the interior appears firmly focused on a sporty driving experience, it still retains the versatility for which BMW X models are known. Both models come as standard with a 40:20:40 split-folding rear seats, enabling luggage capacity to be increased to a maximum of 1,600 litres in the BMW X3 M Competition and 1,430 litres in the BMW X4 M Competition. Standard specification includes BMW Icon Adaptive LED headlights, electric seats with memory, harman/kardon loudspeaker system, Active Protection , Acoustic Glazing , Driving Assistant and Electric folding mirrors. Additionally, both Competition models come with 21-inch Bicolour wheels, an M Sport exhaust system, Black kidney grilles and black tailpipe finishers. The BMW Head-Up Display is standard on both the X3 M Competition and X4 M Competition. This unit projects driving information onto the windscreen and into the driver’s immediate field of vision. Without having to look away from the road, the driver can view information such as the car’s speed on the digital indicator, the gear selected, alerts from the traffic sign recognition system, navigation instructions and a multi-colour M rev band indicator with shift lights. A separate control panel on the centre console and two M Drive buttons on the steering wheel allow drivers to choose their desired chassis set-up. These buttons allow the DSC mode, the engine’s performance characteristics, the settings for the electronically controlled dampers and the steering set-up to be selected independently. The shift program for the eight-speed M Steptronic transmission with Drivelogic is engaged by means of a button on the selector lever. Drivers can use the iDrive menu to select an M xDrive mode with the DSC system deactivated. The iDrive menu also allows them to vary the content in the BMW Head-Up Display. Drivers can use this array of settings to configure two detailed overall set-ups for their car and store them permanently. This means they always have their ideal set-ups on hand. The desired set-up can be activated instantly and at any time by pressing one of the two red M Drive buttons on the steering wheel. BMW Icon Adaptive LED Headlights with variable light distribution, cornering lights and BMW Selective Beam for non-dazzling high beam are standard features on these vehicles. Atmospheric interior illumination is provided by the standard ambient lighting that offers a choice of six colours and can be activated via the iDrive menu. Optionally available is the Comfort Package which combines a number of options that enhance the driver’s and passengers’ comfort levels. Options include Extended Storage ,Steering Wheel Heating , Manual backrest adjustment for the rear seats and Comfort Access. Standard equipment comprises Active Guard, Collision and Pedestrian Warning with City Braking and Driving Assistant which includes Speed Limit Info with No Passing Info display, Rear Cross Traffic Alert, Rear Collision Prevention, Lane Change Warning and Lane Departure Warning. Driving Assistant Plus is optional and additional elements of this feature include the Steering and lane control assistant, the Lane Keeping Assistant with active side collision protection, the evasion aid and the Crossroads warning, Wrong-way warning and Front Cross Traffic Alert. Parking Assistant is featured as standard and includes front and rear Park Distance Control (PDC) and adds a rear-view camera. Furthermore, the system could take over steering, acceleration and braking inputs when the parking assistant system is engaged. It works for both parallel and bay parking manoeuvres. An even broader functionality is provided by the optional Parking Assist Plus with Surround View, Panorama View and 3D Top View functions, while the Remote 3D View function transmits a three-dimensional live image of the vehicle to the driver’s smartphone via the BMW Connected App. Another element of standard specification for the BMW X3 M Competition and BMW X4 M Competition is the BMW Professional Multimedia Navigation System, offering a 10.25-inch widescreen display.Intuitive operation of the navigation, infotainment, communication and vehicle functions is made possible by the iDrive Touch Controller on the centre console, the multifunction steering wheel’s buttons, the intelligent voice control feature and the optional BMW gesture control. The harman/kardon surround sound system is also part of the generous standard equipment features on both the X3 M Competition and the X4 M Competition models. Standard equipment also includes Bluetooth with wireless charging, WiFi hotspot preparation, Real Time Traffic Information with On-Street Parking Information, and Remote Services. Customers can also select Apple CarPlay preparation and in-car music streaming technology in the form of Online Entertainment from the options list. Seamless connectivity between the vehicle and digital devices is overseen by the BMW Connected App. Using the Open Mobility Cloud, it connects with devices such as smartphones, smartwatches and voice assistants to ensure convenient and personalised access to digital services. Functions supported by BMW Connected include route planning on digital devices. This process takes into account calendar entries, real-time traffic information and, where necessary, a refuelling stop and is shown in the vehicle’s navigation system when the driver sets off. The driver can also use the personal mobility assistant to call up vehicle data – such as the fuel level and the car’s operating range – on digital devices, lock the vehicle via Remote Services and continue route guidance from parking location to final destination on their smartphone. The BMW X3 M Competition is priced from £77,070 OTR and the X4 M Competition priced at £79,990 OTR.